When I first visited Mount Holyoke, I could sense its strong community. This was one of the reasons I chose to apply to, and eventually attend, MHC. From the first day I arrived on campus, when two Orientation leaders who were on the swim team greeted me at my car door, I was welcomed into a family. This family has pushed me and made me into a confident woman in more ways that I ever expected. Another reason I chose MHC? Because at a women’s college, women come first. Women matter. This is an exceptionally significant advantage in athletics. There are no men to take the ideal practice times or the better facilities. Women receive the best that this school has to offer. This belief that I matter has been key to my successes as a Mount Holyoke Lyon. I have been a member of the swimming and diving team for four years; this year, I have the honor to serve as a captain. I also spent a year as one of my team's representatives on the Student-Athlete Advisory Committee (SAAC) and a year as the chair of the SAAC. 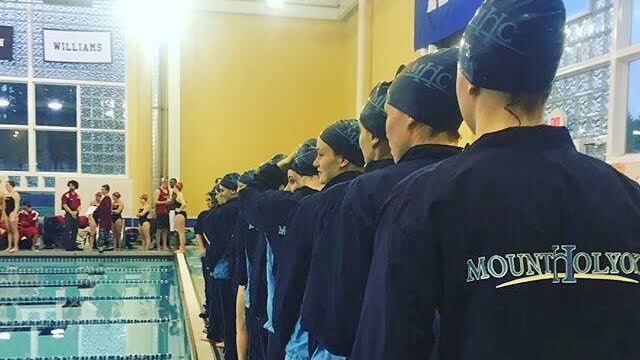 At Mount Holyoke, it’s no surprise that the SAAC is an unusually active group. We vote on NCAA legislation, garner support for important games, and do community service. Our athletics administration values our opinions and our input on how to enhance our experience. Through SAAC, I've been lucky enough to form great relationships with many other student-athletes and Associate Athletics Director Summer Hutcheson. While the purpose of our meetings is to plan for SAAC, Summer has taken the time to get to know me as a person. We talk about my classes, my swimming, and my family. She shares her own experience and offers advice. Even better, Summer comes to athletic events. When you're 12 hours from home, it's reassuring to look at the stands and see somebody you know who cares about you. Student-athletes are making connections like this every season with coaches, athletic trainers, and other staff in the MHC athletics department. These relationships aren’t just a bonus. They are key to our success. Our annual individual goal sheets list academic goals before athletic ones. As a team, we strive for a high GPA, and take pride in our CSCAA academic ranking, in which we were tenth last spring. Dave cares because it matters to him. The “student” truly comes first in student-athlete. My first year, my oceanography professor, Alan Werner, knew that the team had done well at our Conference Championship. The Monday morning after the weekend-long meet, he began class by sharing the accomplishments of the three team members in the class. Embarrassing? A little. Cool? Absolutely. We had represented our college well and he thought we deserved recognition. Three years later, I still remember that small gesture. My peers have made an even larger impact during my time at Mount Holyoke. My teammates were key to helping me adjust and thrive socially and academically. Sophomore year I struggled with some of the neurological aspects of a cognitive psychology class. To my pre-med senior captain, this was basic science. She took the time to make sure I understood my lectures, and while studying together, we grew closer. Now I’m a senior, staring down my final few weeks of being a student-athlete. This is one race I’m not looking forward to finishing—a very foreign feeling for me. But, when I find myself looking back on all of the fabulous memories and relationships I have made, I am filled with pride. For as much fun as I've had, I'm also amazed by how much I have grown. When I graduate in May, I will no longer be a student-athlete in name, but I will be always be a student-athlete at my core. Ready to dive in—and to lead. Eager to learn more, and to seek out mentors and teammates. Confident in myself, my strength, and my grit. Psyched to start the next part of my life, whatever that may be. Cathleen Pruden is a senior at Mount Holyoke from Raleigh, North Carolina, who majors in psychology and education. She’s also a proud student-athlete: She is captain of the swimming and diving team and the former chair of the Student-Athlete Advisory Committee. 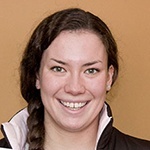 Cathleen is the only swimmer in Mount Holyoke history to earn National All-America honors twice.